Named after the Master of Revels to Queen Elizabeth I and King James I. Edmund Tylney lived at The Mansion which stood on the site of the present library. Former Woolworth store, this typical Wetherspoon’s pub provided a good addition to Leatherhead’s drinking scene when it opened in the late 1990s. 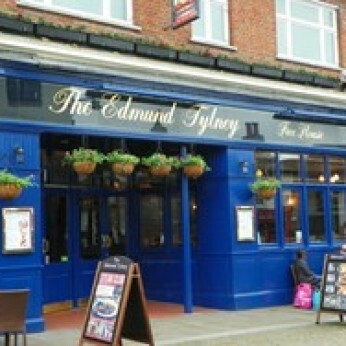 Edmund Tylney, a Leatherhead man, was Master of the Revels to Queen Elizabeth I. This post had the power to licence plays. Bar area has high tables and chairs, plus a raised area with more comfortable seating. The other half is raised and features a large wooden staircase to a balcony. Glass partitions help make the separate booths light but still private. The height of the interior gives it a spacious feel. Children are allowed in until 9pm if they are eating. Usually 5 or 6 changing beers and they vary regularly.